That's the view of the News’ chief sports writer, Neil Allen, after the Blues suffered a 2-1 loss at the hands of Oxford United on Saturday. That result followed quick on the heels of the Fratton Park defeat against Blackpool – reverses that have seen Pompey’s lead at the top of the League One table reduced to just a single point. The Blues’ next league league comes next Tuesday, when they travel to second-placed Luton. 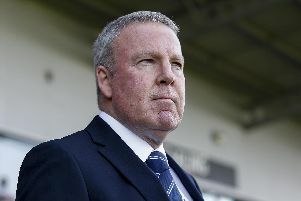 By that stage, though, Kenny Jackett’s side may be below the Hatters in the table, with Pompey in FA Cup duty against QPR on Saturday while Luton travel to Southend in League One. The Blues will need to be in top form, therefore, if they are to put a stop to the Hatters’ 15-match unbeaten league run. But speaking in the latest edition of Pompey Talk, Allen believes too many players have dropped off the boil at Fratton Park for whatever reason in recent weeks. He said: 'We've lost a bit of belief in these past two games. 'It's easy to go back and say Ben Thompson's not there, they're missing Hawkins as well, don't forget. 'Hawkins has got a lot of criticism when Pompey have been winning, but when he's not in the team they're not the same team without him. 'It's easy to point to those but other players around them have suddenly lost form, are suddenly playing badly. 'Ronan Curtis has been right off the boil, (Gareth) Evans and (Jamal) Lowe have struggled in different positions they shouldn't have perhaps been put in in the first place, and even Matt Clarke was a bit dodgy at times on Saturday - and he's clearly the best centre-half in this position.